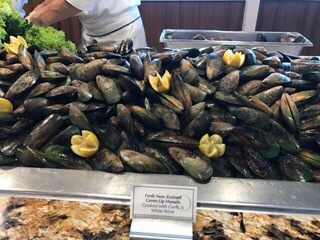 One of the benefits of being on a small ship (and especially an Oceania ship) is that they are able to bring on local delicacies. 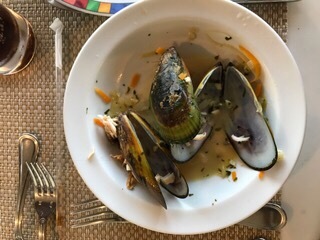 Last night we had the green lipped mussels that New Zealand is known for and exports to all around the world. They were prepared in a tasty broth and were really yummy! 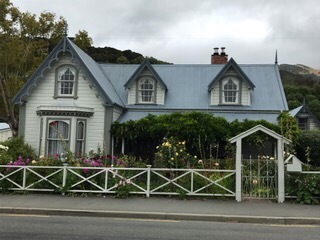 Today we arrived in Akaroa, a small waterside town on the eastern shores of Akaroa harbor. 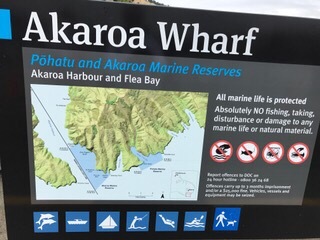 Akaroa means “long harbor” in the Maori language and it is indeed a long harbor. We had to tender in and it took 25 minutes. 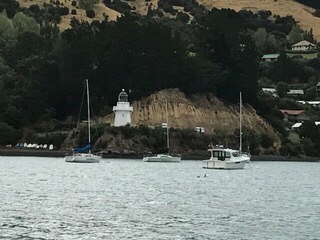 It is southeast of Christchurch where we visited in 2009. As most readers probably know, there was a bad earthquake here 5 years ago. Before that, there was only one cruise ship a year that came here. 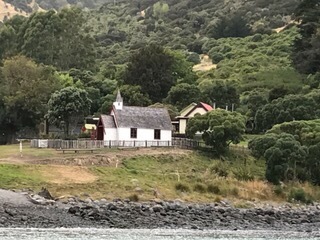 They birthed in Lyttelton instead. 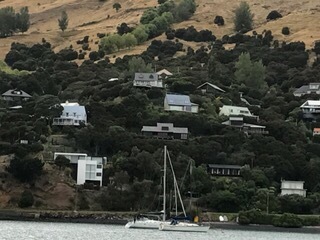 Since the earthquake, Lyttelton has become the cargo port and now 20-30 cruise ships a year come here. Quite a boost to the local economy. In 1938 French Commander Jean Langois traded goods for what he believed to be the entire peninsula and returned to France to encourage settlers to populate a new French colony. Meanwhile, the British sent William Hobson to assume the role of lieutenant governor over all the land that could be purchased and just 6 days before the French arrived the British flag was raised here. The passengers decided to stay which meant that the first formal settlement under British sovereignty was comprised of 63 French and 6 Germans! The British flag still flies on one of the hills. There are only 550 permanent residents here and some of the homes sell for over 1 million US dollars. Two thirds of the homes are baches (holiday homes). 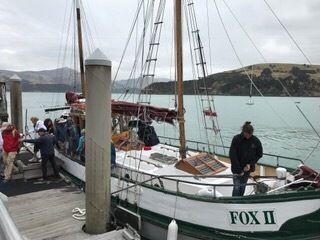 Our excursion today was the Fox II nature sail on a 50 foot ketch built in 1922 from woods indigenous to New Zealand. It was a former cargo carrier and at one time had a steam engine. When they caught the crayfish (New Zealand lobsters), the steam engine was also used to cook a few for the crew. 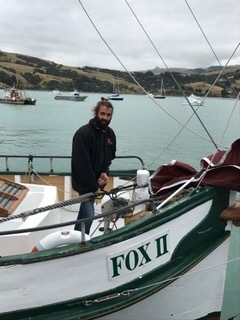 The Fox II is the oldest ketch in New Zealand. 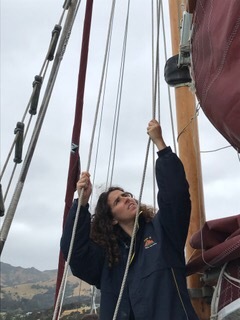 We learned that the square sails provide double the surface area of the triangular ones, enabling more speed. For three months every year, this boat is used to teach children to sail – through a charitable trust – at no cost to the children. It is used for tourism another 3 months and then is in dry dock during the winter. 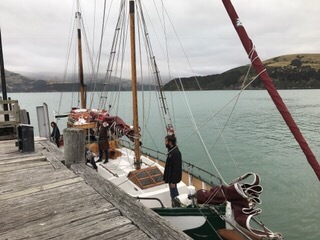 Our crew were French and Italian, in fact, Arturo just arrived from France two days ago. 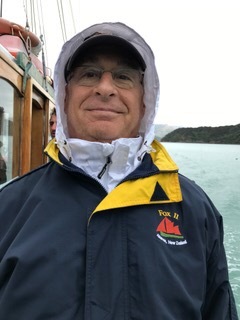 And yes, it was cold. 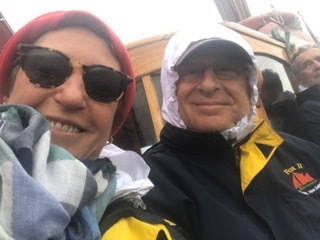 Luckily we had many layers including the warm jackets they provided. It was supposed to get up to 60 today but I don’t think it made it! We had some beautiful views of the scenery. 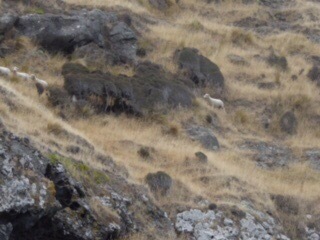 All of the hills are farmed and it was very fun to see the sheep high up on the mountain ledges. There are still 27 million sheep in New Zealand. Hard to see but here is one picture. They do some salmon farming here, the salmon are brought from the fresh water in big tanked trucks, introduced gradually to the salt water and fed well. There are nets covering the farms, but I could not get a good picture since they were on the other side of the harbor. 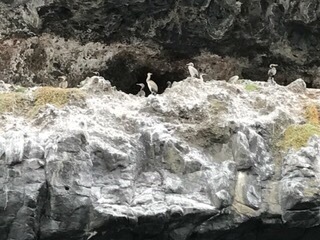 The highlights of the trip included the many species of birds – many shags – which are a species of cormorant that nest in colonies on the rocky cliffs. 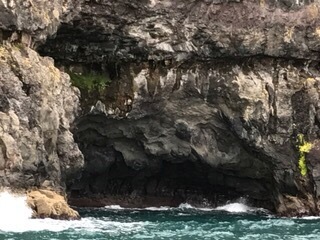 You can always tell where their nests are since their white droppings cover the cliffs. 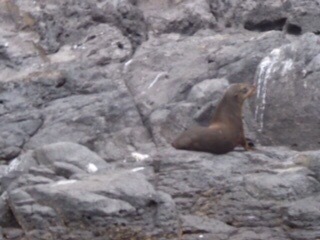 We also saw the little blue penguins, fur seals and the Hector’s dolphin. 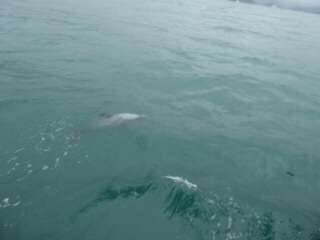 The dolphins seem to like music so when the captain, Roy, put the music on, they were frolicking around the boat. They are quite a bit smaller than most dolphins – they are the world’s smallest oceanic dolphin – and are gray with black and white markings. 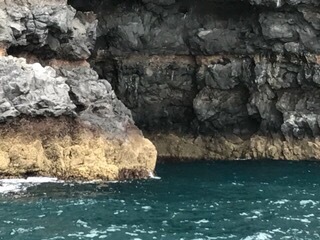 The penguins were floating on the water, they are quite small. 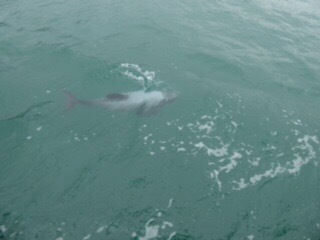 It was a cloudy day and we were afraid we wouldn’t see any as they like to come out in sun, but we were lucky to see 4. They all leave the water in a group at dusk, that must be a sight to see. Everywhere we go, we hear about things that people try to introduce to a new environment. Here there are several that stand out, including the willow trees I mentioned in yesterday’s post. First is the gorse, which is a type of shrub. Good news and bad news – it spreads like crazy and sheep and cows will not eat it. Nothing kills it, they have tried almost every method including burning and pesticides. But the good thing is that it does prevent erosion on the hills. The second is the possum. We see lots of possum boxes in trees used to trap them. They are not like our possums, they are very furry and today I bought gloves made from merino wool and possum! Again, I suppose good news and bad news, but humans probably shouldn’t mess too much with the natural environments, I guess. 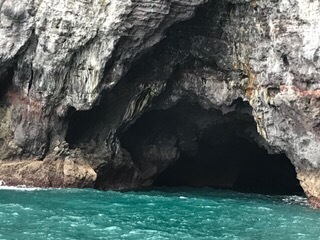 The rocky cliffs are amazing and there are caves all around them. The lines on the rocks are from volcanic eruptions over thousands of years. The water is so clear you can see the bottom from even deep parts of the harbor. 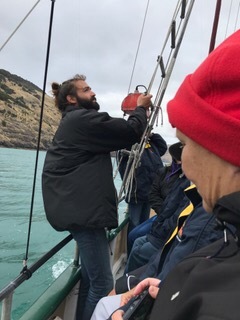 After our chilly but wonderful trip, we were served hot drinks and cookies, and then we explored the charming town of Akaroa. There are lovely houses with the most beautiful gardens. Here is one example. 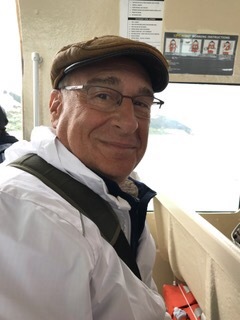 And Norm bought this sheepskin hat and a New Zealand t-shirt. I got the gloves which felt very good today! This entry was posted in Excursions, February, Food, World Cruise 2. Bookmark the permalink.